The event marked the launch the new Digital Leadership Research Centre. 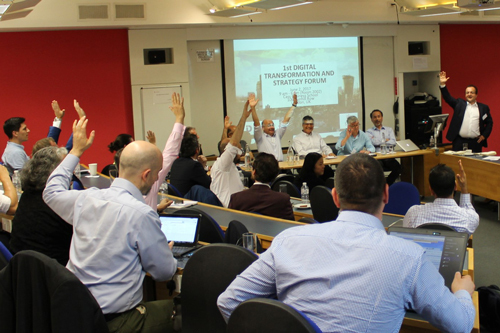 The first Digital Transformation and Strategy Forum was held at Cass, to celebrate the launch of the Digital Leadership Research Centre (DLRC). The event brought together prominent speakers from around the world to discuss the topic of digital transformation, with sessions covering areas such as ecosystems, value creation and entrepreneurship. The current and emerging digital technologies bring several unique transformational capabilities in the business arena and society at large. The event concluded with a lively panel debate, ‘Digital Transformation and Strategy: Do we need new frameworks?’ chaired by the centre’s Founding Director, Professor Gianvito Lanzolla. Professor Lanzolla said, "The current and emerging digital technologies bring several unique transformational capabilities in the business arena and society at large. For example, digitisation of trust, possibility to connect 'everything', exponentially increased data availability, pervasive artificial intelligence. "When coupled together, these technology-enabled, transformational capabilities are likely to challenge much of our received wisdom and frameworks about innovation, strategy and management. Policy makers and managers alike will need to rethink their models to lead, and not the succumb to, the digital transformation. "The forum provided several new perspectives to deliver on the Digital Leadership Research Centre’s Vision of generating insights for leading the digital transformation"
The event proved a productive forum between academics and practitioners to discuss how academic research can help practitioners understand ongoing digital transformation, and what the most urgent questions to investigate in this area are. This will constitute the agenda of the centre going forward.